Galdr means a song or spell: as a word, is similar to the English words enchant and incantation. It is a type of verbal and ceremonial magick. Often it is thought the these types of spells were sung in falsetto. They had a variety of purposes. 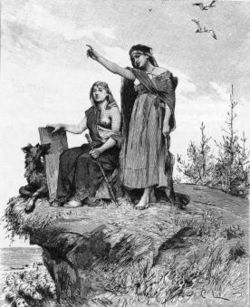 "While Galdr is a valuable and powerful application of Runic Magick, it should be understood that as with all things spiritual the relationship lies between the practitioner and the practice as opposed to any stringent dogma or tradition as truth. Calling the runes is much like prayer - it is a thing one inherently understands, and though much or little may exist within the way of direction, ultimately it is the will to power that proves successful." "A thing to remember is that when speaking the Runes, it should be done with the same comprehension of what it is to call a thing. It is not merely setting in motion a sound or a voice, it is the intent of the will behind the sound and voice that is instrumental. The concept is the same invocation present as in when calling a loved one for dinner, or calling a pet home. It is not mere rote pronunciation or any correctness therein, but a spiritual query behind the voicing itself which is not dissimilar to prayer. 'Calling' the thing is key: You are connecting to the essence through the use of its name the thing which you are trying to create. Through practice and effort and the focus of your will, understanding and success will be soon to follow."